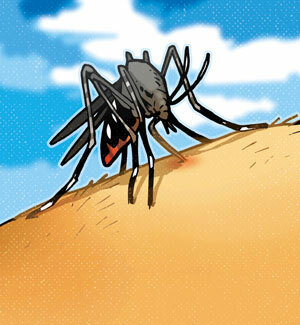 The disease caused by the Chikungunya looks like the flu with fever, headaches and strong muscular pain. It also causes very painful and disabling damages to the joints. Chikungunya means “that which bends up” in the African language Makonde in reference to its arthritic effects on the joints. 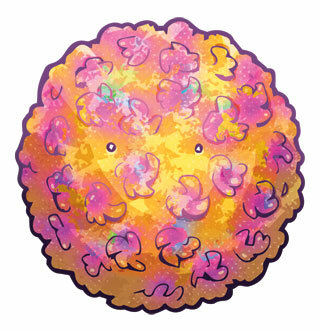 Since the disease is caused by a virus it is useless to treat it with Antibiotic1. It spontaneously heals, but the joint pains can last for several weeks. The Chikungunya virus is transmitted by the tiger mosquito, Aedes albopictus. This insect owes its name to its black and white stripes on the abdomen and legs as well as its great aggressivity. Native to South East Asia, tiger mosquitoes can be found on all continents. In Europe, it is well settled around the Mediterranean sea but, due to global warming, its habitat reaches now all the way to the North of the Alpes..
Only the female feeds off blood. She bites during the day, but mainly at dawn and nightfall. Besides the Chikungunya virus, the tiger mosquito can transmit about thirty other viruses, such as Dengue fever2 , Yellow fever3 , or the Zika Virus 4 . Antibiotic1 = Tropical disease transmitted by mosquitoes of the day-biting Aedes genre. Patients usually suffer of fever and headaches, with some muscular and joint pains sometimes associated with a skin rash. Dengue fever spontaneously heals in about ten days, but serious deadly complications can occur. They present with spontaneous bleedings, from the nose, gums as well as skin. 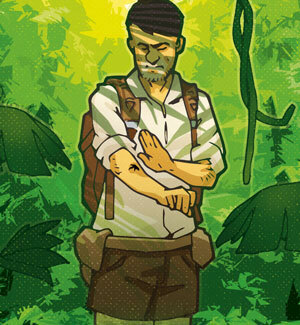 Dengue fever2 = Tropical disease from Africa and America transmitted by mosquitoes. It initially causes fever, shivers, muscle pain and headaches. In the severe form later on, people can experience vomiting as well as having their liver and kidneys affected. Coma and death will then occur in 50 to 80% of the cases. Thankfully, there is a safe vaccine against yellow fever, besides mandatory to travel in some countries. Yellow fever3 = Transmitted by mosquitoes, the Zika virus causes a disease that usually is benign with various symptoms such as fever, headaches, a skin rash, some fatigue and some muscular and joint pains. However, in pregnant women, this virus can be the cause of microcephaly, a severe malformation of the fetus, causing mental retardation. Zika Virus 4 = A drug which allows to kill bacteria or at least to stop their growth. Antibiotics act against bacteria, but do not help treat diseases caused by viruses and parasites.